It all started when I ate at Bottega Louie in downtown Los Angeles for the first time. My boyfriend and I were vacationing in SoCal and went out to dinner with friends — L.A. natives and frequents of the popular restaurant and gourmet market with the most extraordinary bakery. 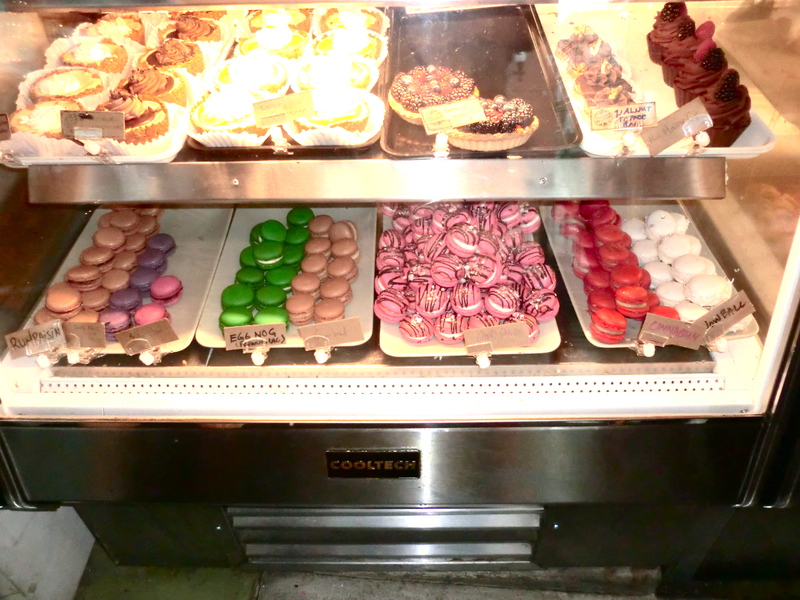 Right as we walked through the door, I noticed an eye-catching rainbow display of macarons; row after row of every imaginable color and flavor of the French meringue-based confection. We decided to peruse the bakery during our one-and-a-half hour wait to be seated (during which we spotted Funk musician George Clinton) and I remember practically drooling on the glass at the hazelnut, raspberry, espresso, violet cassis and even Earl Grey-flavored treats. The petite and airy French macaron (pronounced “mah-kah-rohn” and not to be confused with the coconut cookie, macaroon) is made with egg whites, almond powder, confectioner’s sugar and food coloring. It has a crispy outside, chewy inside and velvety filling. I had only eaten macarons once before then, at a café in Hollywood earlier that week. Getting a box full of them after dinner was almost too good to be true. Although I was happy to be experiencing them for the first time in Cali, macarons have been a fad in the past few years, popping up all over the place. Foodies among others have been dubbing them the new cupcake (because, you know, Cupcake Wars is a thing and cupcakeries are everywhere). Upon returning to Cincinnati, I tried to find the city’s Bottega Louie. I wanted to discover a place overflowing with the ubiquitous macaron that is taking bakeries all over the East and West Coast by storm. After doing a few Yelp searches, I first ventured to The BonBonerie on Madison Road, not too far from my apartment. There were only two types of macarons there when I went — salty caramel and pistachio. Although there was a limited selection of flavors, I was excited to order the pastries in my hometown and got a few of each. They were alright, but the meringue cookie outsides and filling were a bit thick and the macaron didn’t have its expected airiness. I wanted to find a place that offered a lighter pastry with a wider selection of flavors. I later went to Aglamesis Bro’s in Oakley Square, one of my favorite ice cream parlors, to continue my search. Some of their reviews mentioned macarons. However, they didn’t have them when I went. I left with some black raspberry chocolate chip ice cream, so the outing wasn’t a total letdown. I then attempted to go to the S&J Bakery and Café in Findlay Market on a Sunday, but was just a little too late. It was closed. Based on Yelp reviews, the macarons are good there (and are actually sold there) so I unfortunately missed out and need to go back. The French Crust Café on Vine came up on Yelp under the “macaron” search and seemed promising, being a French café and all. There were reviews about desserts, such as pumpkin and chocolate mousse, topped with a macaron. Upon looking at the menu on the website, though, I didn’t see the pastries listed as separate items for purchase and decided to pass. Among a few of the other places in the search results were Take the Cake, Frieda’s Desserts and Donna’s Gourmet Cookies, all of which vaguely mention macarons in the reviews and/or website. However, the one place that stuck out to me in the Yelp search — that I’ve been meaning to try for ages and ages, not just for the macarons but for the food in general — is Taste of Belgium in Over-the-Rhine. It’s a local favorite when it comes to brunch and desserts. I finally paid the bistro a visit over the weekend and, for the first time, felt like I was in a West Coast bakery. I instantly spotted the macarons, which took up an entire shelf. There were eight holiday flavors — Rum Raisin, Sticky Toffee, Sugarplum, Eggnog, Gingerbread, a very decorated Candy Cane, Cinnabun and Snow Ball (Coconut). I ordered a box of them and my sister and I ate them before we even got our brunch. We really couldn’t help it, seeing as to how they’re so pretty and bite-sized. These macarons were similar to the ones I had at Bottega Louie; they were slightly crunchy, had just the right amount of chewiness and were filled with the perfect amount of ganache. While I’m not usually into fads, this is one that I’m glad is spreading within our constantly evolving city. It might have taken me a few months, but I can finally say that I’ve found the trendy yet timeless confections I’ve been craving. And it just so happened to be in time for the holidays, in very appropriate festive flavors.